This Creamy Shrimp Alfredo Recipe is full of creamy, cheesy and velvety sauce all around tender succulent shrimp! 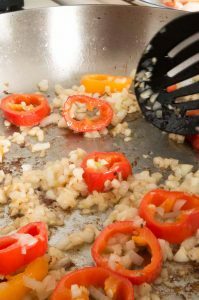 Easy comfort food that comes together in one pan in 30 minute for easy weeknight meal entertaining. 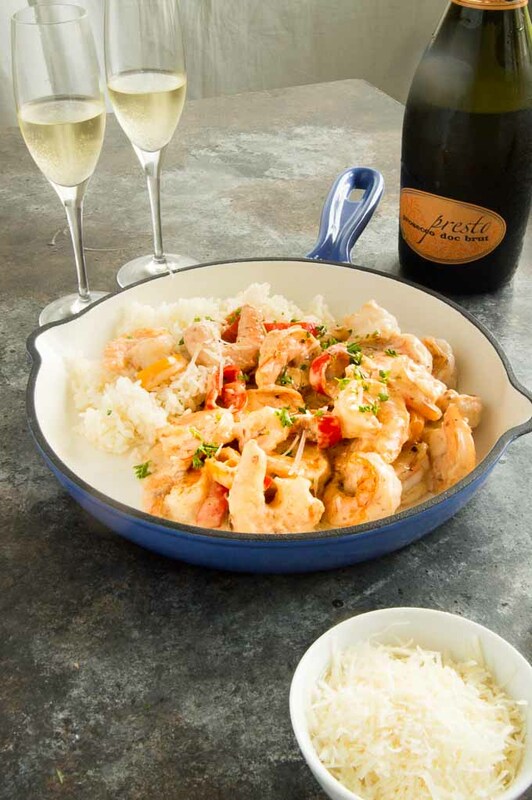 You know I love entertaining with shellfish and I often make Bouillabaisse, but today I’m sharing one of my favorites for last minute entertaining— a shrimp Alfredo recipe. I use it often because it comes together so quickly and I always have everything on hand to make it. 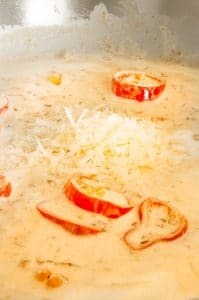 Its a shrimp cream sauce that is full of parmesan and butter that is rich and very versatile. What is in Shrimp Alfredo? The best thing about this recipe for shrimp Alfredo is that you will probably have everything to make it. ENTERTAINING LIKE A PRO TIP: I always have a couple of bags of colossal shrimp in our freezer for pulling out last minute. They are easily defrosted and can be done very quickly. 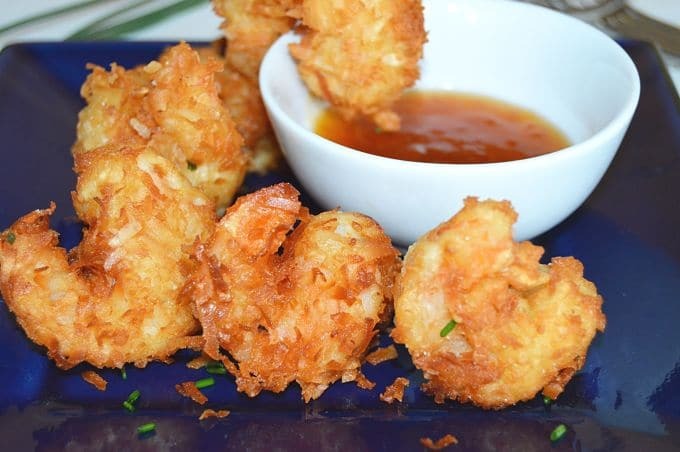 To defrost frozen shrimp, place in a bowl of cold water for 10-15 minutes with plenty of room. Drain water 3 times at 5 minute intervals. Shrimp should be ready to use after 15 minutes or so. When you start you’ll cook the shrimp for a few minutes on each side. You don’t have to worry that they are completely cooked as you’ll put them back into the creamy parmesan sauce at the very end to warm them up and cook them thru. In fact you dont want them to cook all the way or they will be tough and dry at the end. 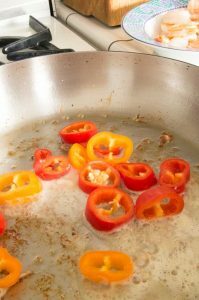 Once they are quick cooked you’ll add butter and soften the peppers. The peppers add a depth of flavor and look great in presentation. If you don’t like peppers, you need not fret they won’t make or break the recipe. 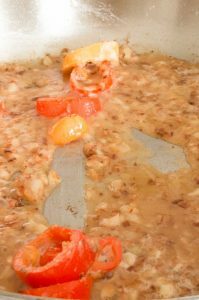 Adding the garlic and onions to soften and caramelize adds a lot of flavor to the creamy sauce. You’ll want to really watch them at this stage so they don’t burn. Adding flour at the end and stirring the flour to coat evenly will help you avoid lumps in the cheesy parmesan sauce. 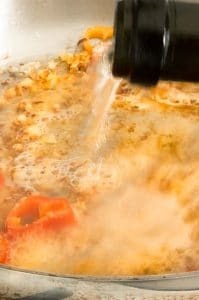 Wine, I really prefer the acidity level of a good Prosecco but whatever white wine you like to drink is what you’ll use to deglaze the pan. What Is deglazing the pan? It’s where you scrape up all the caramelized bits from the bottom of the pan to make sure all that rich flavor ends up in your sauce. 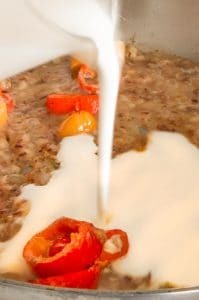 You’ll really let the wine reduce so that the liquid is concentrated and this also keeps your cream sauce nice and thick. Lastly you add the heavy cream and the freshly grated parmesan cheese to get the Alfredo sauce. 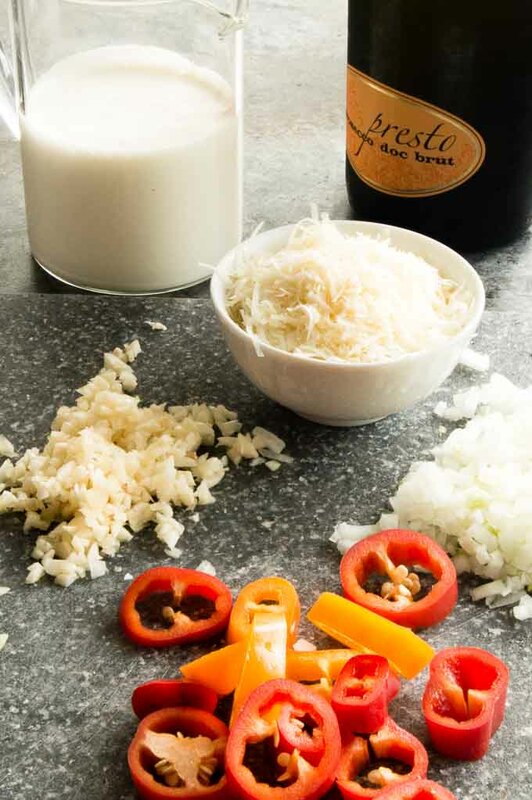 Once the cream is hot and the parmesan is melted …. still in the same pan you started with you’ll add the shrimp in to warm and finish cooking. 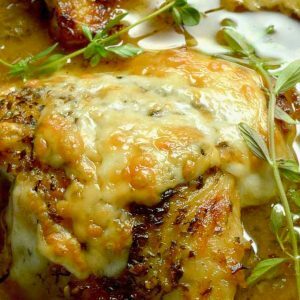 This easy cream sauce will be so flavorful you’ll want to serve it with everything. I’ve even been known to have a couple of spoonfuls like it’s soup it’s so delicious. 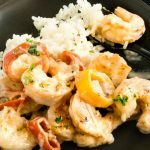 What can you serve shrimp Alfredo Sauce with? It works great as you know with pasta like fettuccini as the original creator suggested or any pasta noodle. It also works well served alone or over the top of plain rice. Spice up the Alfredo with some bold flavors by adding a tablespoon of Cajun Seasoning for a spicier option. 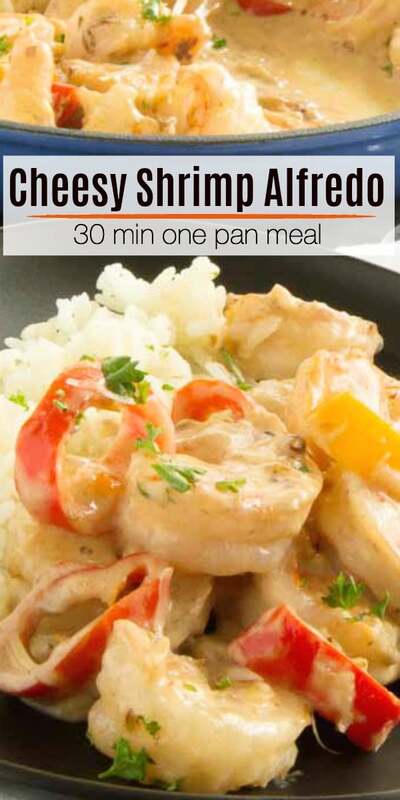 Add spinach or sautéed asparagus in when you toss the shrimp in with the Alfredo cream sauce. 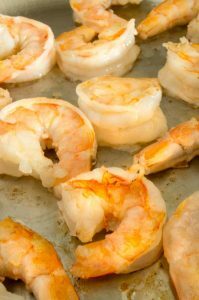 More Shrimp Recipes for Last Minute Entertaining! Pin this to your Make for Company Meals on Pinterest! Lets Be Friends …. follow me on Pinterest for more ideas for stress free entertaining with confidence! Heat a large skillet to medium high and add a spoonful of butter to the pan once hot. Melt the butter then saute the shrimp about 1-2 minutes per side. The shrimp will start to turn white/pink but dont worry that it is not complete cooked thru. It will cook further when added to cream sauce. 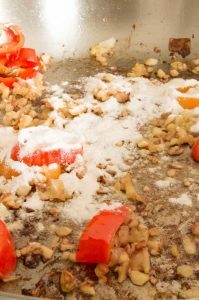 Remove shrimp from pan and place on a side plate. Pour in the wine to deglaze the pan. Using a wooden spoon scrape up any brown bits to incorporate into the sauce. Reduce until 1/2 about 3 minutes. Add heavy cream and stir vigorously until thickened. About 5 minutes. Then add shrimp and cheese and stir until shrimp is warmed and cheese is melted. Serve alone, atop rice, or toss in with pasta and serve immediately. This looks delicious & tasty. Thanks. Alfredo is my favorite! This sounds like such an awesome meal! This was magnificent!! My whole family went bonkers for this one — the presentation was gorgeous and it was SO EASY!! Thanks! 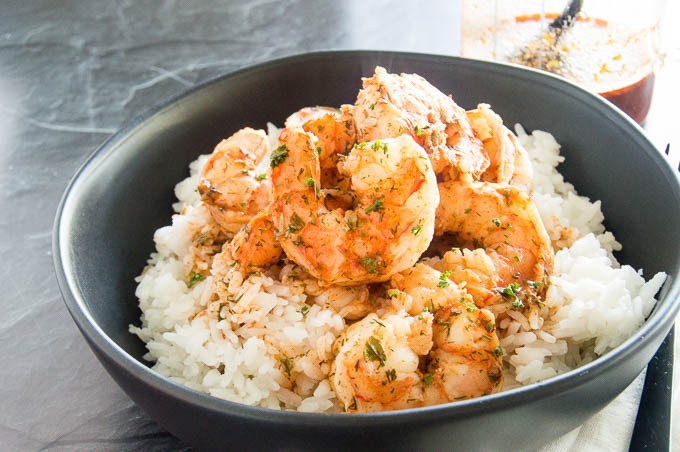 This shrimp dish sounds incredible! The flavors in that sauce are perfection! Great great family meal!!! 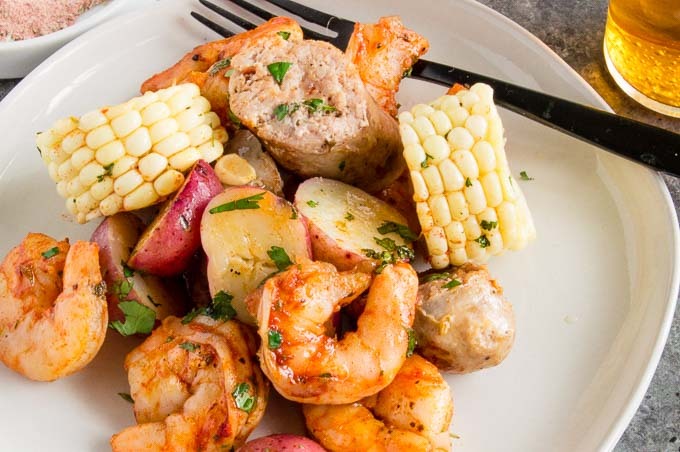 Shrimp is one of our favorite things too…. 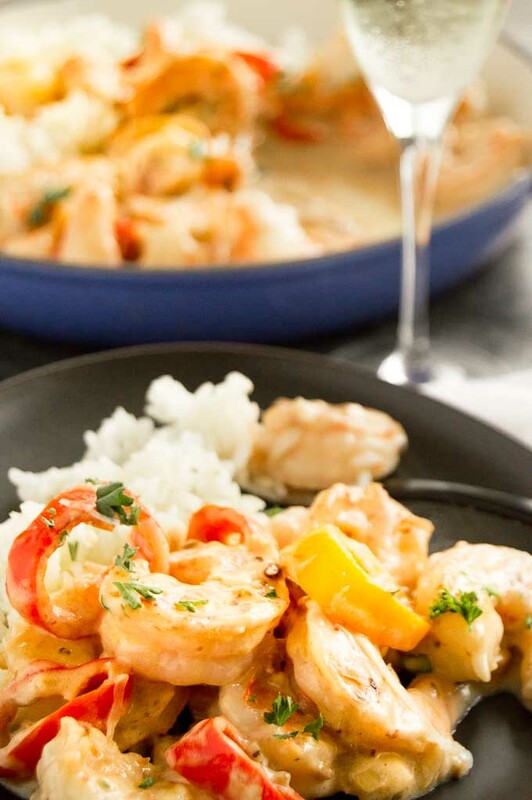 Shrimp and pasta go hand in hand….add some alfredo sauce, pour me a glass of wine….and I an a happy girl. Like you I always have shrimp in the freezer. 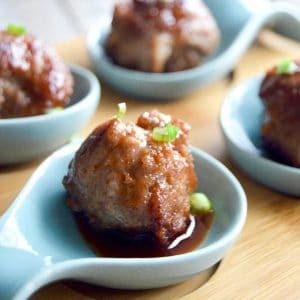 This is the perfect meal to serve to guests. I LOVE you little collage of photos….nice idea. This is the perfect meal to end the week. I would serve this any night of the week. Thank goodness for Mr. Di Lelio! Alfredo is very close to a permanent fixture on our dinner menu and I have to admit, we have ever tried it with shrimp. Thanks for the detailed process photos, they will definitely be a help to us when we put this beauty of a dish together. 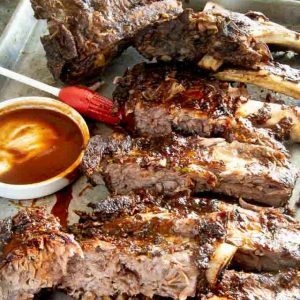 Fantastic recipe, as always! 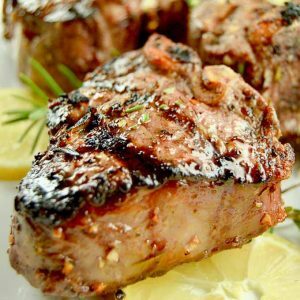 I love the option of adding some cajun seasoning for a little kick of flavor, and thrilled that such a delicious meal comes together in under 30 minutes! We devoured this meal! I love the addition of peppers to this Alfredo! Thanks for a great recipe! I love a good homemade alfredo sauce and your step by step photos are suer helpful!! Can’t wait to try this one!